A limited quantity of back issues are available for $4.00 each. 10% discount for orders of ten or more magazines. Please call (515) 576-3191 to order or to request more information. Understanding Algae: So What's All The Stink About? What is a CPESC and What Does it Mean? "No More Straw Bales, Please!" Historical 1897 Boston-area park updated. Ever Wonder How It All Began? As Concentrated Animal Feeding Operations in the U.S. increases, geosynthetic waste containment becomes even more important. An emergency situation within the rocky terrain of the Adirondack Parkway, with slopes eroding into the Upper Hudson River Watershed. How Does Your Landfill Cover Grow? LICA’s Legislative Liason, John Peterson, presents a brief overview of the process and the hurdles that lie in the path of federal legislative success. Seed Under or Seed Over?! Reclaiming of land and water impacted by abandoned coal mines in Pennsylvania. Customers lend a hand in building a 250’ x 90’ “World’s Most Extreme Pond”. Restoration of the Platte River: What is the Target? Do Native Grasslands Have a Place on Roadsides? In the Limelite at Last, WEED AWARENESS! What is Required for Effective Sediment Control? Which Grass Seed Works Best? Slope Reinforcement of a "Natural Solution to King County"
Is It a Wall or a Slope? Soil capping of a cell in the Sumter County, South Carolina landfill. Soil Amendments: Solutions or Snake Oil? 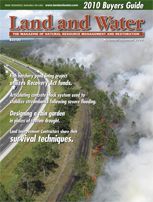 Case study on stormwater elements of a suburban roadway improvement project. Stormwater system at St. George Sound in Eastpoint, Florida designed to reduce debris, suspended solids, heavy metals and other contaminants. SWPPP Soup - Does Anyone Have a Good Recipe? Implementing the Storm Water Pollution Prevention Plan... On the Mark, Get Set... Go? Are We Passing the Buck? What Has Phase II Done to the Erosion & Sediment Control Industry and Do You Have the Knowledge You Need? When Best Management Practices Become "Bad Management Practices"
Secret Canyon Creek Finally Sees the Light: A Beautiful Urban Tributary Stream is Unearthed! Trout Unlimited Chapter Tends the "Tully"
Streambank Stabilization Using a New BMP ... Compost? Natural Recolonization in Treatment Basins? Uncontrolled non-native species can crowd out native plants, alter the character of an ecosystem and disrupt wildlife habitat. Arundo donax is listed as a noxious weed in both Texas and California but a few dedicated groups are knocking this weed down to size. Teamwork and PressureSecured Technology Save a Stream! Just how long will corrugated HDPE pipe last? Will Your Pond Hold Water? A Vision for the Illinois River? Replacing wetlands disturbed by state’s road construction. South Carolina's Wetland and Wildlife Wonderful! Does Wetland Mitigation Work in the Long-term? Wetland Restoration - Myth or Reality? !